One food that unites the entire country would be ‘chaat’. A delectable savory snack made with a combination of lip-smacking ingredients. The base can either be puri, tikki or vada which is smeared with tongue-tickling chutneys, sometimes curd and finally a sprinkle of dry spices, crunchy sev and coriander. Depending upon the chaat it is stuffed or topped with vegetables. Previously, chaats were popular street food but these days, even the fanciest of restaurants have an array of chaat on the menu with funky variations. Nothing can be more exciting than having a plate of Ragda Pattice, Aloo Chaat or Dahi Vada accompanied by the friendly banter of friends and family. Aloo Tikki chaat from the North, Bhel Puri from the West, Pani Puri from East, honestly, the list is never ending as you have got variations to these delights. Chaat are the perfect comfort food. They are totally customizable. You can make it just like you want it to be – you can tweak the ingredients used, the level of spiciness, and everything else. Health freaks can opt for nutritious ingredients like sprouts and low calorie options like oats, khakhra to give a healthy twist to the dish. 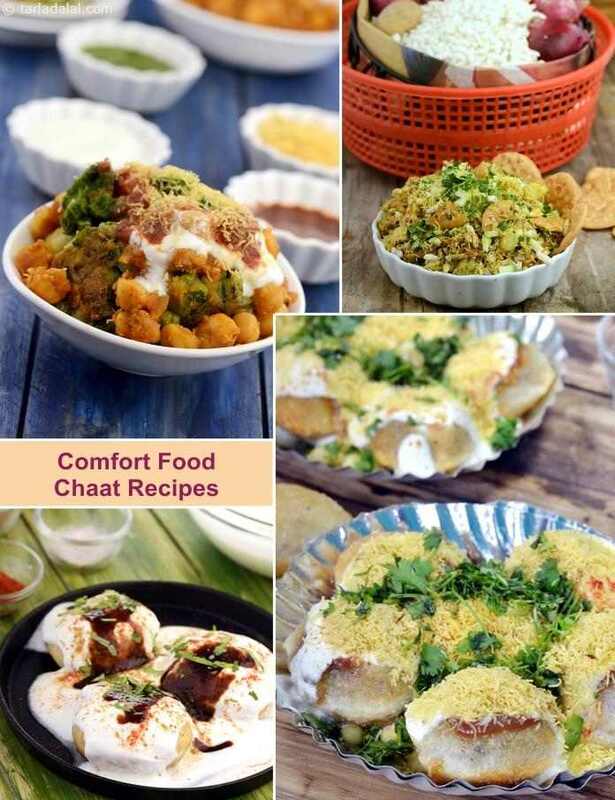 Here is a list of few of my favorite comfort food chaat recipes. Bhel is one of the most popular chaats in Mumbai. It is prepared with puffed rice, juicy vegetables and an assortment of chutney. There are many variants of Bhel like Sukha bhel and Gila bhel, depending upon the type of chutney used. Golgappe, Phuchka, Gup Chup call them anything, this one snack is loved all over India. The amalgam of phudina pani and imli chutney complement very well. They are either stuffed with boondi or ragda. Enoy our Comfort Foods Chaat Recipes and other comfort food recipes articles. Sev puri, let’s call it the indian canapé! tiny discs or flattened puris serve as the base to hold an astounding topping of veggies and chutneys, garnished with sev! an appetiser that can steal the thunder out of any meal! what’s more, you’ll get a dish of around six puris for just rs. 10 to 15. Visually appealing and delicious, the til in this chaat is a perfect calcium boost and hence a healthy choice for snacking or entertaining.